New Year's Day this year brought with it more than just the start of another year. The dawning of 2011 also marked a milestone: The first of the nation's 76 million baby boomers turn 65, traditionally the age at which many Americans start retirement and all the life changes that brings with it. 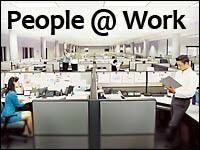 A new poll suggests, however, that a majority of Americans aren't keen on tossing in the towel on their careers at age 65, with 71% saying they believe workers should be encouraged to stay on the job, according to a survey conducted by Marist College in Poughkeepsie, N.Y.
Perhaps unsurprisingly, the survey found that older Americans by greater percentages thought boomers (born 1946 through 1964) should stay in the workforce past retirement age, including 75% of boomers themselves and 79% of the generation that preceded them who fought in World War II. Though by smaller percentages, a majority of younger Americans also said boomers should keep working past retirement age, with 65% of Generation X (born 1965 to 1981) and 62% of the Millennial generation (born 1982 to 2000) backing the idea of working past 65. Further, the Marist poll showed that 69% of Americans -- including 71% of Gen X-ers and 61% of Millennials -- believe they have a responsibility to provide for those who retire before them. Despite strong numbers that show respondents feel they should provide for retirees, the Marist survey also reveals many are fearful that society and the economy will pay a stiff price for the post-war population explosion. Some 61% of Americans are worried or very worried that baby boomers will bankrupt Social Security, while 59% believe the needs of aging boomers may overload the U.S. health care system. Whether those fears will be borne out remains to be seen. But one thing is clear: Baby boomers plan to hang around for a while. A recent AARP survey showed that on average those turning 65 in 2011 expect to live until they're 85.2 years old -- only 3.5 years short of the average length of time they want to live -- 88.7 years. Overall, AARP says its survey of 801 Americans who turn 65 this year reveals that boomers are generally satisfied with their lives and optimistic about the next third of life, though they continue to face nagging concerns about financial security and improving their health. Health and financial stability affect boomers' outlook, with many saying they expect and want more time with family and friends, and are concerned about their children's future. As with their own parents, AARP found, boomers turning 65 don't plan to move. "Aging in place" is desirable because boomers have established lives where they now live. Still, in one aspect boomers turning 65 are different from their parents in that they view work as a core part of retirement. Indeed, a significant percentage of those polled by AARP said they would "never consider themselves retired." That is, of course, different from they way boomers' parents defined retirement -- as a time to travel, enjoy and relax but with little work outside hobbies or charity activities. What's more, many boomers simply can't retire. Squeezed by caring for elderly parents and children who have moved home or need financial assistance in the wake of the Great Recession, many boomers find they don't have the time or financial wherewithal to retire. Regardless, it appears many boomers are content to take on the challenges that life continues to throw at them -- even if they aren't as young as they used to be.